Last month I discussed the “eskimo words for snow” myth and wrote about how just because a language doesn’t have a word for something doesn’t mean people can’t talk about it anyway. To expand on that idea, people seem to be absolutely fascinated by the idea of untranslatable words: words that occur in other languages and express concepts we didn’t consider word-worthy in our own. I’m not sure why we love this evidence of our human diversity, except that it’s always fun to have your brain tweaked with the idea that the way you think of things isn’t the only way. You can see that these words are, in fact, translatable, because I’ve given them translated definitions. What we really mean is that we have no single word that is the translation of the single word in the other language. The technical term for that is a lacuna, or lexical gap. But in fact as I went browsing looking for examples of fun words, it looked like many of those listed on various web sites really do have a decent translation, sometimes even in a single word, sometimes as a word phrase. (For example, gattara (Italian) means crazy cat lady, plain and simple.) But here are a few fun “untranslatable” words I found that seem to me to fill some English gaps. And that brings me to the wonderful thing about English: that we can tingo our neighbors’ vocabularies! Of course, it isn’t really stealing, because they can keep their words, too, so if you ever come across a word you think English needs, help yourself. 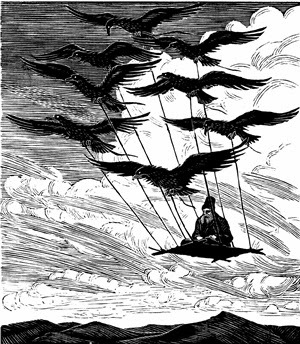 English does it all the time, from raccoon and sushi, words that were untranslatable because English speakers didn’t have the things they refer to, to déja vu and chutzpah, words that seemed pithier or more evocative than our own homegrown ways of expressing the concepts. So next time you’re admiring the beauty of the komorebi (it’ll be a while ’til we have any leaves here!) go ahead and call it by name! This lovely, magical wood engraving is by W.O.J. Nieuwenkamp, a Dutch artist (1874-1950) who travelled widely both through the Netherlands by houseboat, as well as through the East, especially Bali. 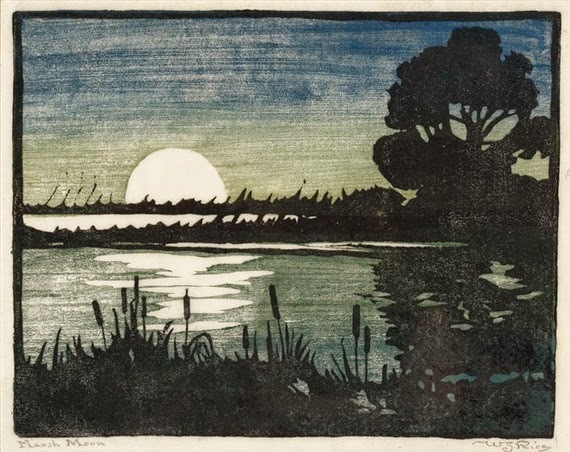 (I featured another of his wood block prints here.) Being an engraving, this piece is very finely detailed, with different beautiful textures for roofs, walls, trees, grass, and even a delicately patterned border. The thing I find most interesting and appealing about it, though, is how it combines what I assume is reasonable realism with distinctly art nouveau style. 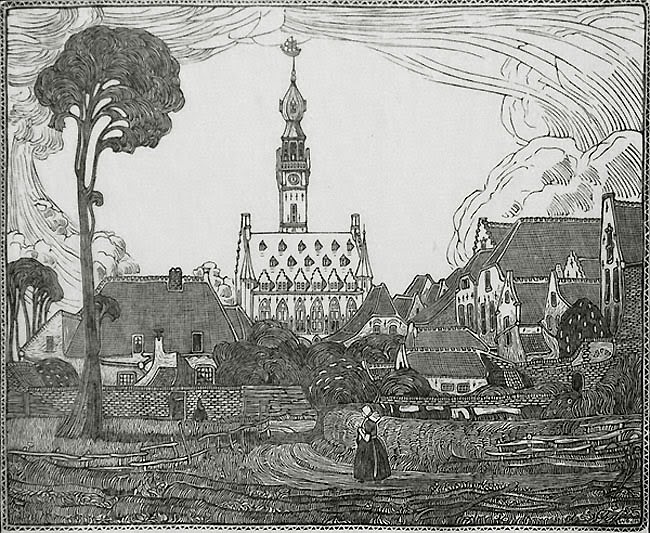 I don’t have a photo of this view of the town of Veere from this era, so I have no way of knowing how much artistic license Nieuwenkamp took with the shapes of the buildings or their arrangement, but I’m assuming that this was at least accurate enough to be recognizable. At the same time, however, he’s made the clouds and trees quite stylized, flowing and twirling in a way probably never seen in life. It’s almost as if he applied an art nouveau filter to the scene, but the filter has a fade so that the stylization is weakest in the center of the piece and gets stronger and stronger as it goes out toward the edges. Nieuwenkamp has succeeded in that delicate balance that I’m always striving for: how to show something of beauty so that the viewer recognizes and appreciates it as a celebration of the world, but at the same time to do so with a distinctive aesthetic or take on it so that the viewer looks at it and appreciates it in a new way. Gustave Verbeek (b. Verbeck, 1867-1937) was a cartoonist who created a number of newspaper comic strips in the early 1900s. Two of his strips in particular, “The Terrors of the Tiny Tads” and “The Loony Lyrics of Lulu” centered almost entirely on fantastical creatures and wordplay, two of my favorite topics. Actually, most of his strips range from utterly random to downright disturbing, but along the way he came up with a number of amusing and clever creatures. Verbeek’s beasties are generally mash-ups made of words that can be blended together, for example the porcupinaeapple and the caribooklet. I particularly like the vehicles, such as the hippopautomobile and the perambulatortoise. Some hybrids include fantasy creatures, such as the dragonion, which is heavy on the onion and light on the dragon, and the banjogre. But of course they’re all completely fantastical. better - Verbeek’s tend toward rather random gratuitous violence (They are “terrors,” after all) - but both revel in additional puns and wordplay to go along with the fun and funny creatures. Perhaps one of the real values of these silly creatures is how they naturally inspire you to think up your own. Just sitting here this morning I can’t help but start mashing words together and seeing what I get. So far my favorites are the pelicanopener, hollyhocktopus, artichokapi, clockroach, kumquotter, helicoptermite, and capybureau. What new and wonderful creatures can you discover? This is a Lockheed Vega circa 1930. It’s based on the beautiful bright red 5B Vega used by Amelia Earhart to fly solo across the Atlantic and solo nonstop across the USA, both in 1932. Earhart sold her airplane to Philadelphia’s Franklin Institute when she bought a new one, and it eventually came to the Smithsonian, where it’s now on display in the Air and Space Museum. 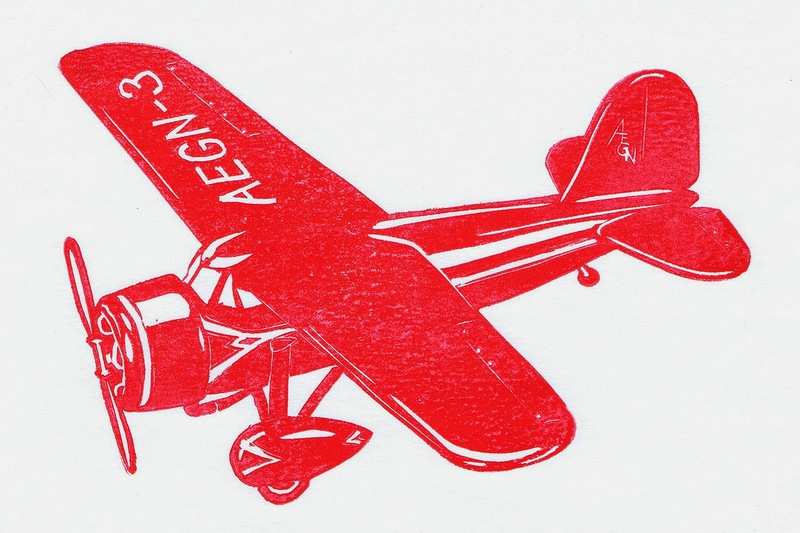 It’s a jaunty, brave little airplane and struck my fancy right away when I was thinking about adding a plane to my assorted block printed vehicles. Why an airplane? Well, I’ve always liked the look of old aircraft, just as I like vintage automobiles and steam trains, so the real question is not why, but why now? And the answer is that a few weeks ago I got a lovely e-mail from the mother of a boy who has my steam locomotive hanging in his bedroom. They were wondering if I’d ever considered doing a print of an airplane… Well, I had considered it. A number of times, actually, and this was the push I needed to go ahead and finally do it. There’s a biplane I plan to do as well, when I get to it, but this was a great little block for me right now. So far this year I’ve had to spend an awful lot of time on things that take busy work but don’t feel particularly creative, and until this piece I hadn’t made a single new block this year (or managed to spend much time on writing, either, alas). So this simple piece that could be quickly carved was just right to give me a little art lift without taking too much time. Well, I was all pleased to have fit a little quick carving into the past two days, and then I went to print. That should have been quick, too… but it isn’t! It turns out that my tube of red ink is a little too dry and and I’m having the devil of a time getting clean, clear prints. In fact, after two attempts I still haven’t managed to make a decent edition. I’ve added some water to my ink and I’ll leave it to sit overnight, and try again tomorrow. But in the meantime, here’s what I’ve got so far. I hope it lifts your spirits on this grey February day. Nordstrom spent a good deal of time fighting to publish children’s books that really were for children, that celebrated children’s thoughts, feelings, and experiences rather than trying to force-feed children whatever uncreative adults believed they ought to have. In 1954 she wrote in exasperation, Oh hell, it just boils down to: you just can’t explain this sort of basic wonderful stuff to some adults… [Some] books can be bridges between the poor dull insensitive adult and the fresh, imaginative, brand-new child. But of course that will only work if the dull adult isn’t too dull to admit that he doesn’t know the answers to everything. All too often I come across this snobbery, that children’s books are lesser, wimpier, lite versions of real literature, to tide over the lesser, wimpier, lite people until they grow up and become adults capable of appreciating “real literature.” Such attitudes, like much criticism, tell us more about the critic than the subject, and in this case, such comments betray adults who have probably not read any children’s literature since they were ten, who may never have read anything good, and who, if they ever have read excellent children’s books, have forgotten their power, or were too dull, unimaginative, ignorant, and self-important even to realize what they were reading. The desire to be thought intellectual is a deadly enemy to the imagination. Undoubtedly it is true that children can’t read or get everything out of adult literature, and thus not all adult literature is appropriate for children. But is it true that all children’s literature is inappropriate for adults? Does it follow that adults like me who read fantasy (particularly juvenile fantasy) are hiding from reality in some pathetic state of arrested development? I’ve written about these questions before (What Makes Juvenile Fantasy Juvenile? and The Importance of Fantasy (II)) and I don’t want to repeat myself, but I do want to add a few quotations I’ve come across more recently that speak to this question, especially the question of whether children’s books are lesser than adult books or, as Nordstrom implies, actually better than adult books. What both these authors imply is not that children’s books are better than adults’ books, or vice versa, but that the best books are simply… books. That they have something of value to offer people over a wide range of ages and stages. That the true classics are written not with deliberate intent to appeal to a particular market segment, but are written because the author has something of truth and value to share, and it really doesn't matter whether the best format for sharing that author’s truth is a picture book, a middle grade chapter book, or a literary novel. Maurice Sendak, interview with Stephen Colbert, 2012. We’re breaking all kinds of snowfall records around here, and although the kids are back to school this morning, it’s snowing again now. The funny thing, though, is that we had no snow to speak of all winter until the very end of January, so the towering piles of white still seem pretty and even sort of fun, rather than old, tired, and grinding. So here I am with two more relief block prints of snowy scenes. I’ve chosen to pair these two because of their contrasts. 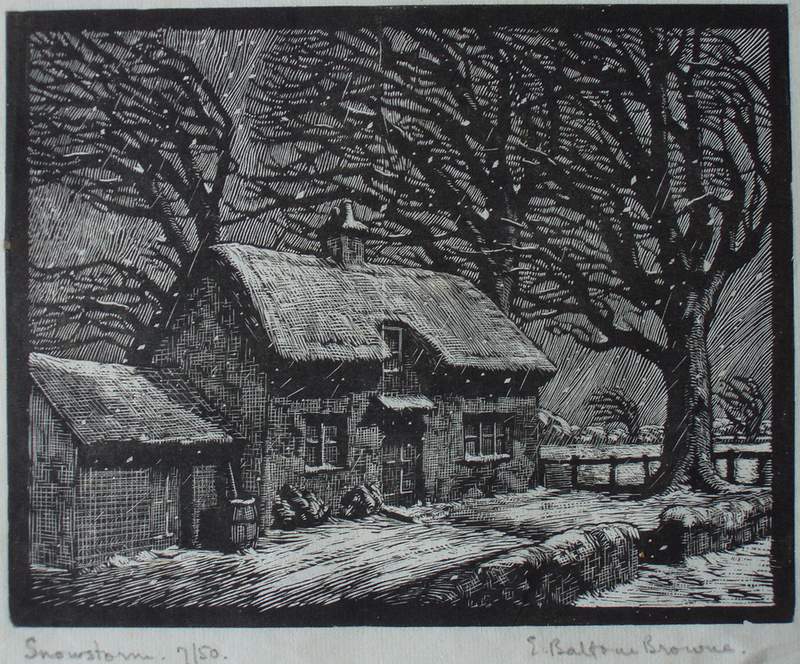 The first, by Eileen Balfour-Browne, is a wood engraving, and despite it being a scene of snow, there are no large areas of white. The whole thing is meticulously detailed with the fine lines characteristic of engraving tools. There are lots of realistic details, from the rain barrel to the footprints going in at the front. My favorite thing about it is the black trees that are really just gaps in the texture of the falling snow. 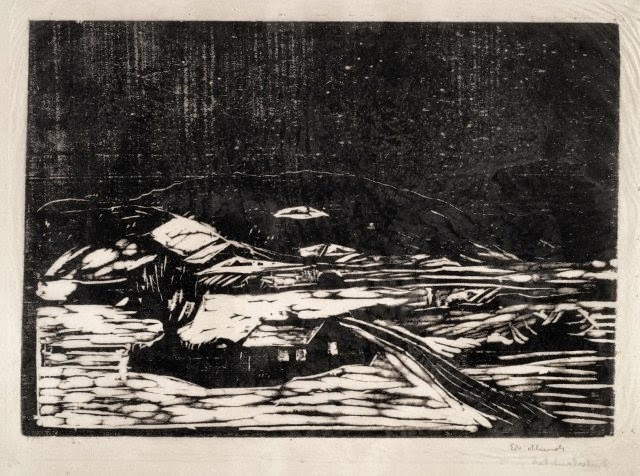 Today’s second piece, by Edvard Munch, is rough and impressionistic, using a wide gouge instead of fine engravers, and emphasizing the thick blanket of snow covering the ground and roofs, rather than the fine, whirling flakes. There are no details, no carefully depicted realistic touches, and yet this piece still gives a sense of the heaviness of the snow, its silence and its weight. I like that two such different carving techniques can both be so effective. 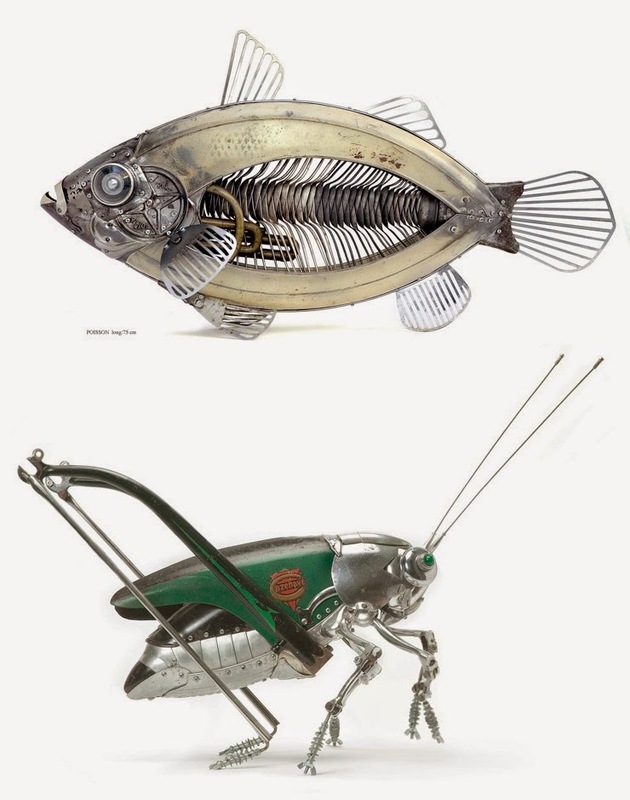 I’ve posted previous collections of marvelous steampunkish animal sculptures (here and here), and today I have the work of two more artists to show you. I just couldn’t limit myself to one piece from each of them to make them fit into the previous post. Indeed, I couldn’t even quite manage to limit myself to only three each. 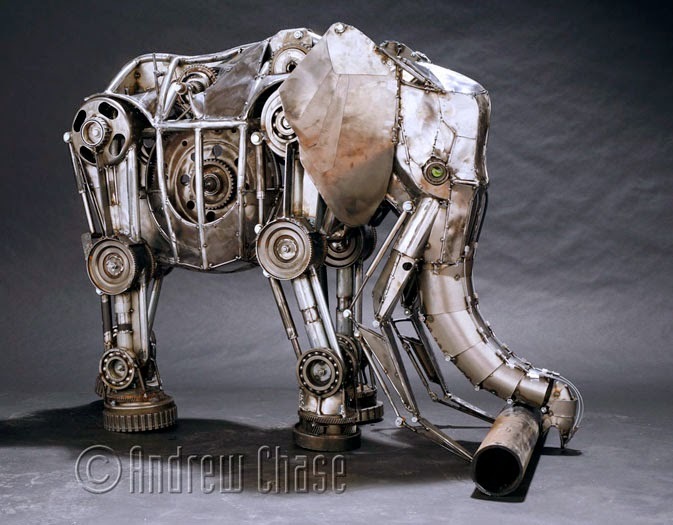 At first glance Edouard Martinet’s animals look as if they’re sculpted the traditional way, from clay cast in metal. But look closely and you realize that they’re assemblages of all sorts of bits and pieces. Martinet is so masterful at picking the perfect piece of junk to make each element of his subject’s form that I’m in awe. See if you can find these parts in the sculptures shown: spatulas, brass musical instrument, bicycle bodies, and hacksaws. The ribs of the fish are nested spoons! Martinet uses screws to hold all the pieces together, so they really are beautifully constructed as well as beautifully designed. I’m utterly in love with these animals! his cheetah sculpture is stop-motion, because I just don’t see how it would be possible for it to run like that on its own! 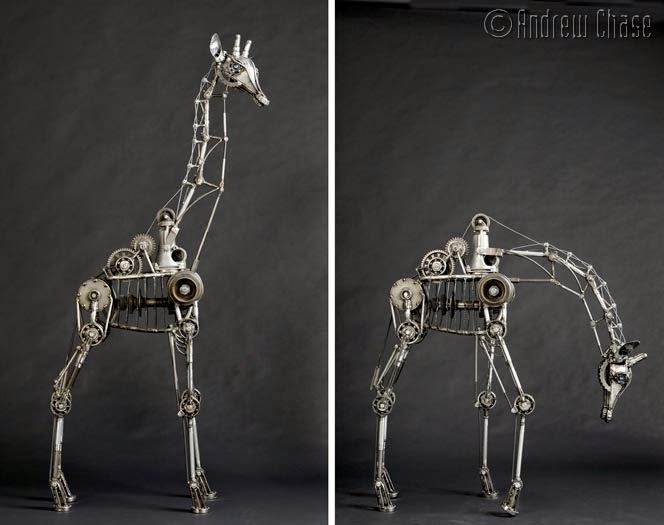 You can see in these pictures of his giraffe how elegantly the joints allow movement and the cable supports it. The elephant can pick up a large metal pipe with its tusks and trunk, and in the picture above is shown just getting hold of the pipe. And finally, two words: robot dinosaur. Oh yeah! As with all steampunk sculpture, part of the fun is the reusing of pieces that might otherwise be discarded, and part of the fun is applying technology all over the place in fantastical ways. Part of the fun is the craftsmanship that aims for beauty as well as functionality, and part of the fun is the surprise of seeing something unexpected. That’s a lot of parts of fun, isn’t it? I know, I know: everyone’s a critic. But I have to confess that having seen some of M.C. Escher’s pieces broken down into the proofs from their separate blocks, there were a few that I liked better in plain black and white without their color blocks at all. Here are a couple of examples. What do you think? First up, the Mobius strip with ants. 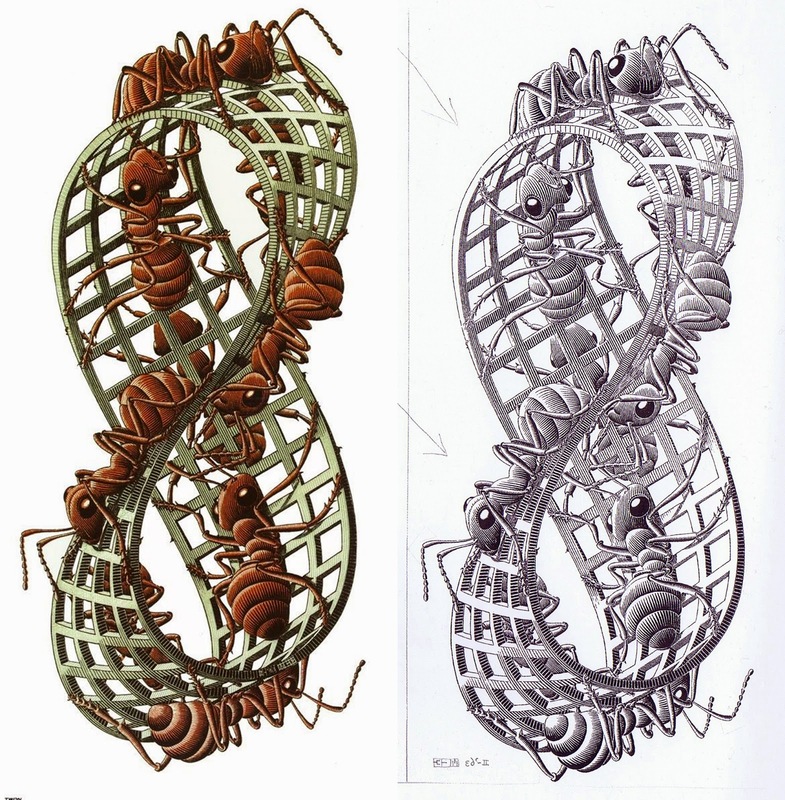 In the finished version, the ants are red and the lattice of the Mobius strip has a pale greenish-grey. Beside it, I’ve put the proof of the black block only. And what can I say? I like the black-and-white better. I would be curious to see this piece with the red ants but no grey. Perhaps that would have the pop of the red but also the pop of the black and white. I assume that Escher himself probably did try the various combinations, but I have not seen such a version anywhere. I know that Escher experimented with different color variants in his prints, because there are several different versions of this cool planetoid. This one with strong terra cotta I found posted on-line, and the colored version on display at the exhibit I saw in December was paler colors, I think a yellow and the greenish color. 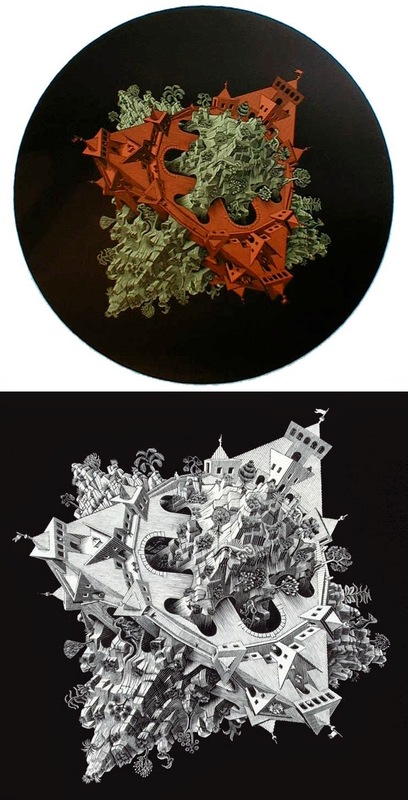 In one of my books there’s a version with only one color, a yellowish beige, and then there’s also the black and white version, which Escher published not just as a proof of the black block but as a final version in its own right. It’s true that the two colors emphasize the interlocking pyramids that form this planetoid, especially when the colors are highly contrasting, as in this version. But the trade-off is that in emphasizing the geometry, the colors de-emphasize and dull all the other details. And the details here are really wonderful and, in my opinion, deserve to be the full and complete focus of the piece. Look closely and find the dimetrodon, all the dinosaurs, people dining on the terraces, and the mountain goat! Finally, here’s another piece with black plus two colors. 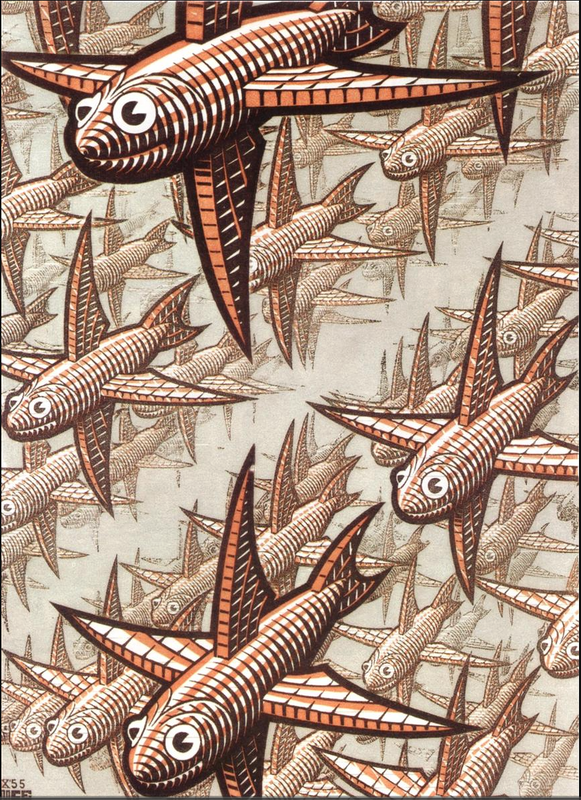 Escher was obviously aiming for a depiction of depth, and infinity fading into the distance. Hence the faint beige-ish color covering over the farthest fish to help them appear to fade away. 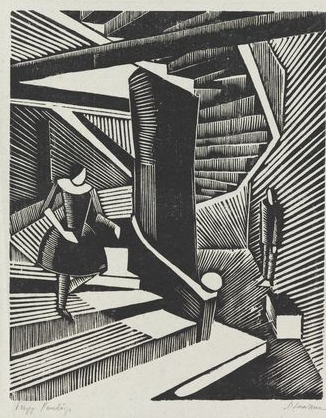 Nevertheless, when I saw the proof of the black block alone at the exhibit, I thought Escher’s masterful carving did the job just fine without muddying things up with color. The black only version had all the infinite distant fish, but sharper, crisper, and cleaner. These funny fish-critters are excellent enough to stand (or fly) on their own without any extra color or shading. Unfortunately I can’t find a picture of the black only to post here, so you don’t know what you’re missing! I guess the moral of the story, if there has to be one, is that if Escher had one fault, it was the tendency to make his prints more complicated, more intricate and multi-stepped, than they needed to be. Often black and white is not merely enough, but is just perfect on its own.